Amaze your friends with this gravity-defying trick! 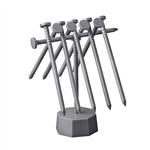 Challenge them to balance ten nails on the top of just one nail. When they fail, show them how it’s done – with no glue or magnets! These tricky puzzles will keep you busy for hours and coming back for more! With 12 different puzzles to choose from, once you solve one, you have to try them all! Measures 8.25 x 6.75 x 1.12 in box. Ages 8 & up. WARNING: CHOKING HAZARDSmall parts. Not for children under 3 yrs.